8 months back when we moved into our own place, many were the plants and trees that we couldn’t identify at the peak of winter. And this one particular tree kept us guessing for at least a good three months. And lo behold, one fine spring morning we saw the most precious of pale pink buds glued to those branches. Who would have thought that this one bald leafless, dwarf like tree would flower into the most beautiful pink blossoms and few months down the line, give us such luscious fruits? My first experience of nature’s bounty in my own backyard especially in my first year in our home was memorable. 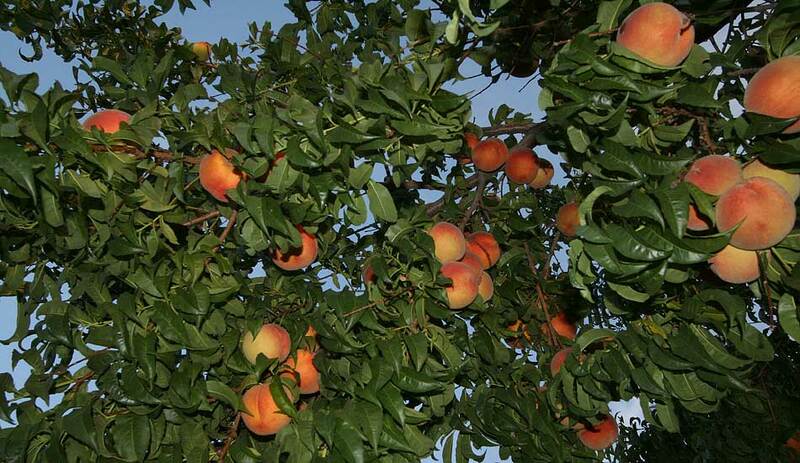 Peaches hung off our tree like bunches of golden tennis balls with a slight pinkish red blush. Here we were thinking we’ll let those peaches grow nice and big and ripe and we’ll pluck it off our trees. What a wrong move that was! By the time we headed into our backyard with our buckets and broom sticks, we found that some of our sneaky feathered visitors had made a meal of nearly 70% of those fruits. Even with the rest of the peaches that we could salvage, we got quite a sizeable number. And here we were reveling in this gorgeous spring offering, we found that we obviously couldn’t keep all these gorgeous fruits to ourselves. We gave away dozens to extended family and friends. And were still left with lots more. If someone said twiddling thumbs was a sign of idleness, I wouldn’t agree to it. So here I sat twiddling my thumbs thinking up ways to use the remaining peaches. I thought I’ll play word association so I can come up with some ideas and surprisingly came up with quite a few words – Peaches and cream, Peach Cobbler, Peach Strudel, Peach Conserves, Caramelized Peaches with Ice cream….not bad for an off the top of my head response. I decided to go with Peach Cobbler as I recalled the fact that many books I had read made a mention of it and I was of course craving for cake and something ridiculously sweet as always. Googling the first recipe that came along, I scanned the ingredients and method. And I found that it was easy as pie too!!! My sous chefs mum and Ram did a fine job of the prep and I must commend them on their enthusiasm and efforts. The prep took all of 15 minutes and the baking 40 minutes. 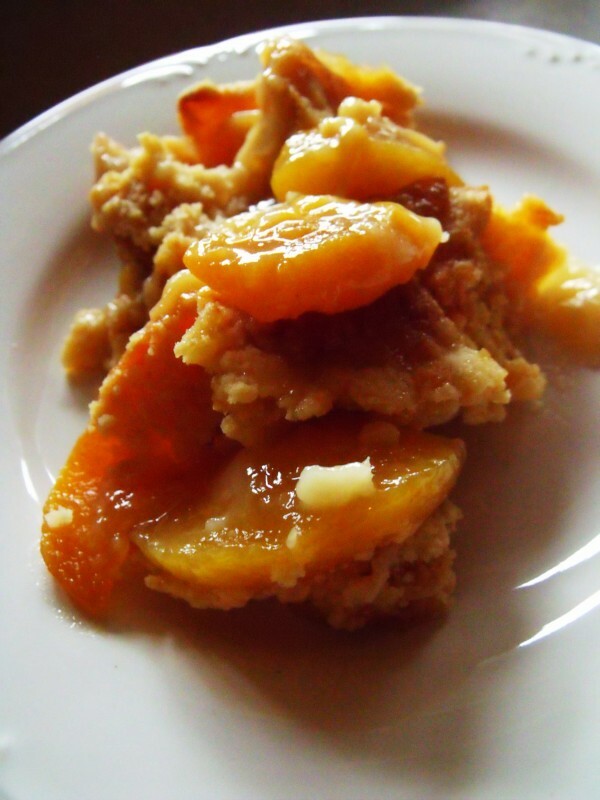 End of the happy hour, not having any more patience to wait any longer, I happily cut up some chunky pieces of the hot Cobbler the moment I took it right out of the oven and we heartily enjoyed that rustic country-style dessert late afternoon. Every mouthful was peachy perfect. And not too shabby for a maiden attempt if I can say so myself. I highly recommend this recipe. The measures were perfect for me. It was perfect the way it was even without the ice cream/whipped cream serving suggestions. Coming up next, time for some good old home-made Peach Conserve. I am s’peachless’ !!!! Awesome and mouth watering!!! !Do not mind another piece of it. Enjoyed your post very much as I had witnessed the whole thing. What’s next in the list? Well since you have been in the plot knee deep let’s keep that to ourselves Mum 🙂 And thanks Mum seems like your kai manam rubbed off on that..
Of course perima…we’ll put some off into the freezer. Am hoping you’ll still get to see the tree with the last of the peaches on it 🙂 Really looking fwd to your visit.